Changs and Changes: Layouts & Plans, Oh MY! I know, I've tried to explain to you guys before how my layout in my bathroom was prior to the renovations. 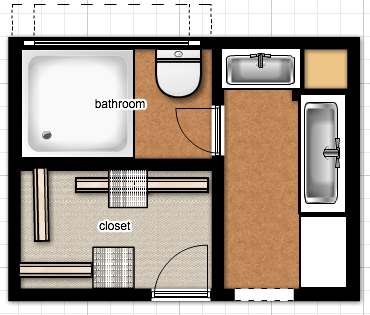 But I thought showing the floor plans would explain it a lot better! 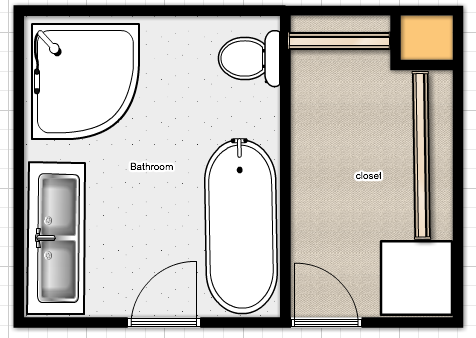 Here are was the format of the bathroom before. Can you see the L shape it was before. And the entry way to the bathroom was just an open entry way without a door. The only door was the one that separated the sink area to the shower, and toilet area. (with the giant window inside). And there was a linen closet on the right of the entrance. As for the closet, it seemed like we had a storage, but the rods were placed so mismatched with shelving that it became limited with space, oddly enough. When we were coming up with the format of the new bathroom, we decided not to over complicated, even though it seems like it was when we try to explain, but in reality, a wall was knocked down, and a wall was added. (plus we added vaulted ceiling) Now, everything is one big open space. The bathroom even had room for a tub! It feels more updated and the space feels more concise. And the walk in closet is more open, and has longer rods, and it's doubled. We are going to add more storage space to the left side, we just haven't gotten there yet. And the right has a whole ton of shelves for shoes. It's so great! This is what it looks like now. The door where the closet used to be actually got moved more to the left. And you can see the bathroom has tons of natural light. And the closet is more spacious. And as for the nook, it got walled up, and is now a vaulted ceiling inside. This layout makes more sense to me, and works way better for us too. Renovations seem scary, and in a way it kind of is since you're trusting someone with your home. But oh man, what a difference it can make! I think the key is to kind of have a plan of what you want prior to the renovations. We knew what wanted, and knew it was possible to do. It might have seemed weird when we explained it to the contractors, but when they understood, they immediately got it what our vision was! And I'm happy to say, we got what we wanted in the end and I couldn't have asked for anything more.